This chapter provides information on testing and debugging ADF Mobile applications developed for both iOS and Android platforms. Section 19.1, "Introduction to Testing and Debugging ADF Mobile Applications"
Section 19.2, "Testing ADF Mobile Applications"
Section 19.3, "Debugging ADF Mobile Applications"
Section 19.4, "Using and Configuring Logging"
You cannot run the ADF Mobile application until it is deployed. For more information, see Chapter 17, "Deploying ADF Mobile Applications." Test the application's infrastructure, such as a splash screen, application feature navigation, authentication, and preferences, ensuring that all declared application features are available. If the application includes ADF Mobile AMX content, test this application feature's logic, page flows, data controls, and UI components. Make changes to the application as necessary. Reconnect the mobile device or restart the simulator, and then deploy and run the application for further testing and debugging. Testing on a mobile device: this method always provides the most accurate behavior, and is also necessary to gauge the performance of your application. However, you may not have access to all the devices on which you wish to test, making device testing inconclusive. Testing on a mobile device emulator or simulator: this method usually offers better performance and faster deployment, as well as convenience. However, even though a device emulator or simulator closely approximates the corresponding physical device, there might be differences in behavior and limitations on the capabilities that can be emulated. Typically, a combination of both approaches yields the best results. Testing with the Accessibility Inspector on an iOS-powered device simulator. For detailed information, see the "Testing the Accessibility of Your iPhone Application" section in the Accessibility Programming Guide for iOS available through the iOS Developer Library. Testing with the VoiceOver on an iOS-powered device. For more information, see the "Using VoiceOver to Test Your Application" section in the Accessibility Programming Guide for iOS available through the iOS Developer Library. JDeveloper is equipped with debugging mechanisms that allow you to execute a Java program in debug mode and use standard breakpoints to monitor and control execution of an Oracle ADF application. For more information, see the section on debugging applications in Oracle Fusion Middleware User's Guide for Oracle JDeveloper. Since an ADF Mobile application cannot be run inside JDeveloper, the debugging approach is different: you can use the JDeveloper debugger to connect to a Java Virtual Machine (JVM) 1.4 instance on a mobile device or simulator and control the Java portions of your deployed ADF Mobile application. From the JDeveloper's main menu, click Application > Project Properties to open the Project Properties dialog. In the Project Properties dialog, select the Run/Debug/Profile node. Using the Run Configurations pane of the Run/Debug/Profile dialog, create a new configuration, or click Edit to modify an existing one. 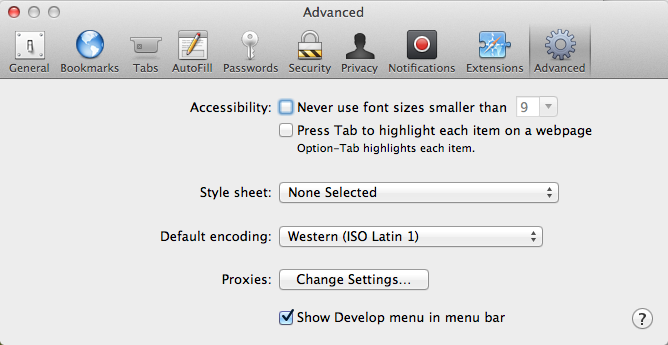 In the Edit Run Configuration > Launch Settings dialog, select Remote Debugging. Expand the Tools Settings node of the Edit Run Configuration dialog, then expand Debugger, and then select Remote. - Set the protocol to Attach to JPDA. - Set the host to one of the following: 1) For simulator or emulator debugging, set to localhost; 2) For the device debugging, ensure that your development computer can access that device over the network (you may use the ping command to test network access), and then enter the device's IP address. - Set the port to the appropriate port number. - Set the timeout to 2. Deploy the application to a mobile device or simulator (see Section 19.3.1, "How to Debug on iOS Platform" or Section 19.3.2, "How to Debug on Android Platform"). The port number must match the one you set in JDeveloper. Redeploy the application to the mobile device or simulator. Launch the application in a mobile device or simulator by clicking the application icon. Use the debug icon on JDeveloper's main menu to select the run configuration (the one that you defined for your project in step 3). 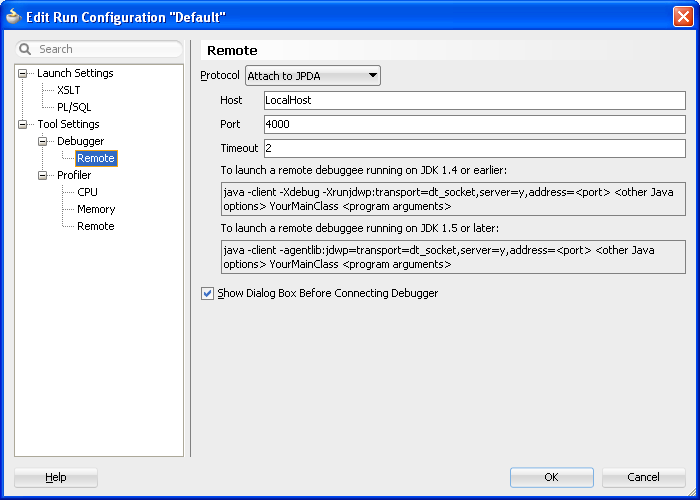 Confirm the debugger Attach to JPDA Debugger dialog. To avoid timeout (20 seconds), start the debugger immediately after launching the application on the mobile device or simulator. If you use the mobile device for debugging, you have to connect through WiFi. Section 17.1.1.2, "Deployment of the JVM 1.4 Libraries"
"Testing and Debugging ADF Components" section in Oracle Fusion Middleware Fusion Developer's Guide for Oracle Application Development Framework. To debug an ADF Mobile application on the iOS platform using JDeveloper, follow the generic debugging procedure described in Section 19.3, "Debugging ADF Mobile Applications." Section 17.4.1, "How to Deploy an iOS Application to an iOS Simulator"
Section 17.4.2, "How to Deploy an Application to an iOS-Powered Device"
Section 17.4.4.2, "Registering an Apple Device for Testing and Debugging"
To debug an ADF Mobile application on the Android platform using JDeveloper, follow the generic debugging procedure described in Section 19.3, "Debugging ADF Mobile Applications." For information on how to configure an Android-powered device or emulator and how to deploy an ADF Mobile application for debugging, see Section 17.3.1, "How to Deploy an Android Application to an Android Emulator." If the connection is made through Wi-Fi, ensure that this connection is correct. It is recommended to place both the debugger and target on the same network without the use of the virtual private network (VPN). If your ADF Mobile application includes the ADF Mobile AMX content, after you configure the device or emulator, you can set breakpoints, view the contents of variables, and inspect the method call stack just as you would when debugging a web-based ADF Faces application. For more information, see the "Testing and Debugging ADF Components" section in Oracle Fusion Middleware Fusion Developer's Guide for Oracle Application Development Framework. 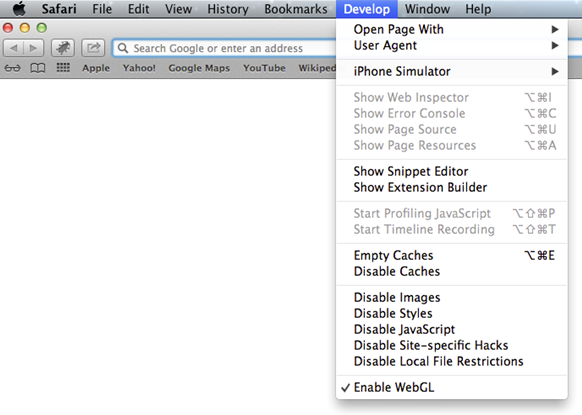 java.debug.enabled: Enables or disables Java debugging for ADF Mobile. Valid values are true and false. When java.debug.enabled is set to true, the JVM waits for a debugger to establish a connection to it. Failure of the debugger to connect will result in the failure of the ADF Mobile AMX application feature to load. java.debug.port: Specifies the port to be used during debugging. The valid value is an integer. For information on how to use JDeveloper to debug the Java code, see Section 19.3, "Debugging ADF Mobile Applications." 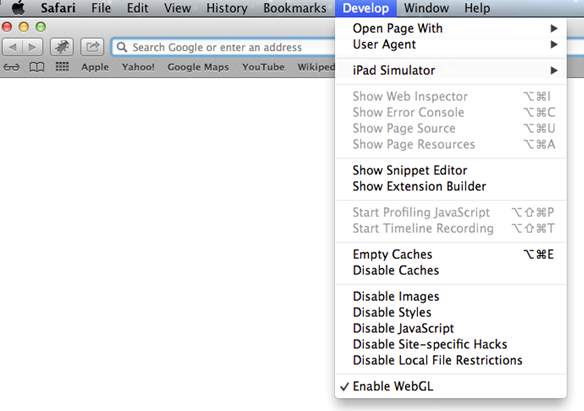 When the Develop menu is enabled, select either iPhone Simulator or iPad Simulator, as Figure 19-3 and Figure 19-4 show, and then select a UIWebView that you are planning to debug. Whether the Develop menu displays an iPhone Simulator or iPad Simulator option depends on which device simulator is launched. You use the application's deployment profile to specify either the release or debug execution mode for your ADF Mobile application. The debug mode allows for inclusion of special debugging libraries and symbols at compile time. 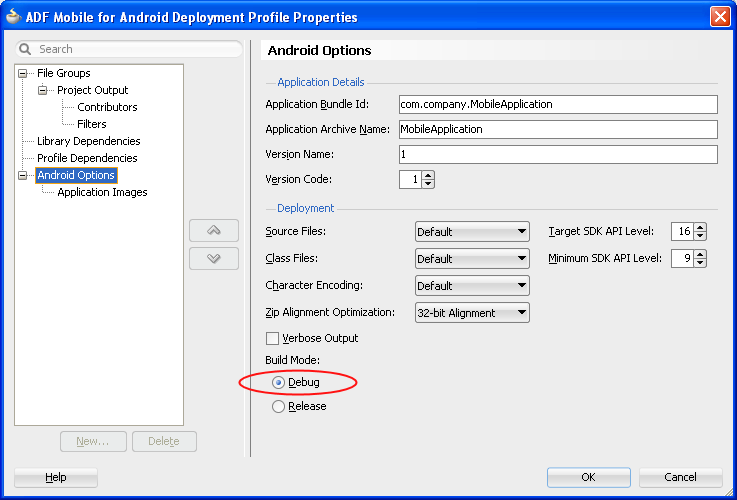 Figure 19-5 shows how to set the debug mode option on Android. Figure 19-6 shows how to set the debug mode option on iOS. This ADF Mobile app was deployed in Debug mode and should not be used for performance evaluation purposes. Set the deployment profile Build Mode option to Release for performance testing. Section 17.2.3, "How to Create an Android Deployment Profile"
Section 17.2.4.1, "Defining the iOS Build Options"
Section 17.4.4.1, "Creating iOS Development Certificates"
The logging begins at application startup. The existing log file from the previous application run is deleted, so only the contents of the current run are available. When you are running your application on an iOS-powered device, the console output is redirected to an application.log file that is placed in the Documents/logs directory of your application. On Android, the output is forwarded to a text file with the same name as the application. The output file location is /sdcard. If this location is not present or is configured as read-only, the log output is rerouted to the application's writable data directory. The logging.properties file is automatically created and placed in the Descriptors/META-INF directory under the Application Resources (see Section 19.4, "Using and Configuring Logging"), which corresponds to the <application_name>/src/META-INF location in your application file system. In this file, it is defined that all loggers use the com.sun.util.logging.ConsoleHandler and SimpleFormatter, and the log level is set to SEVERE. You can edit this file to specify different logging behavior (see Section 19.4.1, "How to Configure Logging Using the Properties File"). In your ADF Mobile application, you cannot use loggers from the java.util.logging package. The logger that you are to use in your ADF Mobile application is the ApplicationLogger. You can also use methods of the oracle.adfmf.util.logging.Trace class. Example 19-1 shows the logging.properties file that you use to configure logging. The oracle.adfmf.util.logging.ConsoleHandler plays the role of the receiver of the custom formatter. %LOGGER%—the name of the logger to which the output is being written. %CLASS%—the class that is being logged. %METHOD%—the method that is being logged. %TIME%—the time the logging message was sent. SEVERE: this is a message level indicating a serious failure. WARNING: this is a message level indicating a potential problem. INFO: this is a message level for informational messages. FINE: this is a message level providing tracing information. FINER: this level indicates a fairly detailed tracing message. FINEST: this level indicates a highly detailed tracing message. When selecting the amount of verbosity for a logging level, keep in mind that by increasing the verbosity of the output at the SEVERE, WARNING, and INFO level negatively affects performance of your application. The logger defined in the logging.properties file matches the logger obtained from the oracle.adfmf.util.Utility class (see Section 19.4, "Using and Configuring Logging"). The logging levels also match. If you decide to use the logging level that is more fine-grained than INFO, you have to change the ConsoleHandler's logging level to the same level, as Example 19-2 shows. To make use of the properties defined in the logging file, you need to use the adf.mf.log package and the Application logger that it provides. Example 19-3 shows how to use the logp method in an ADF Mobile application. Embedded logging uses the com.sun.util.logging.Logger, as illustrated in Example 19-4. Note that the EmbeddedClass represents a Java class defined in the project. Even though it is not recommended to manipulate your ADF Mobile projects with Xcode because you can lose some or all of your changes during the next deployment with JDeveloper, you may choose to do so in exceptional circumstances. 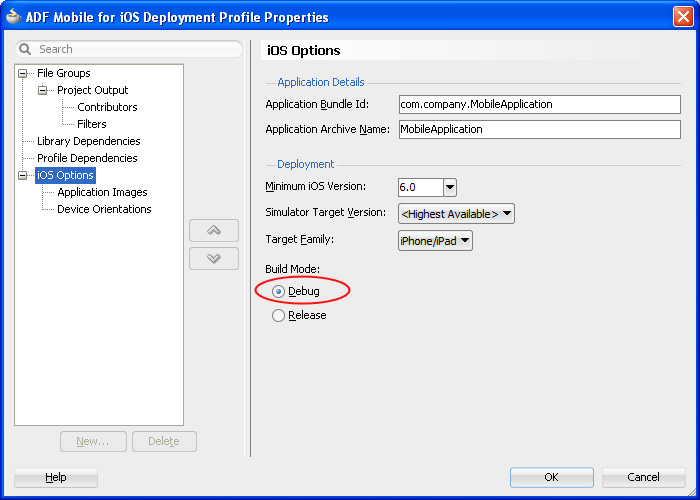 Deploy the application to the iOS simulator from JDeveloper. Navigate to the workspace_directory\deploy\deployment profile name\temporary_xcode_project\. Open the Xcode project called Oracle_ADFmc_Container_Template.xcodeproj.